To make sure that Drake’s Place was a truly inclusive project, we ran a wide-ranging consultation prior to its restoration. This garnered over 800 comments and ideas on how we could bring the gardens and reservoir back into community life for everyone to enjoy, with opportunities for events, leisure, learning activities, training and volunteering projects. Local community support, including through the Friends of Drake's Place, was crucial in making this project happen and is as important now as it was then. 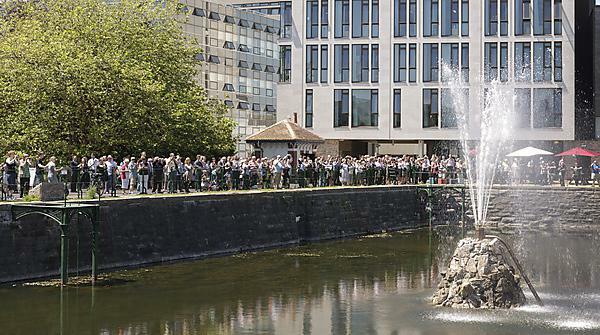 The Friends of Drake’s Place is a friendly and important group comprising comprise local residents, councillors, faith leaders, teachers, curators, partners, Plymouth University staff and students. If you would like to become a Friend please contact us. Join our regular volunteers and help ensure the beautiful gardens and reservoir are maintained to their multi-award winning standards. Our volunteers help with things from litter clearing in the gardens and reservoir, sanding benches and spot weeding to creating insect boxes and supporting biodiversity activities and research. Gloves and tools are provided as well as a hot drink afterwards. Volunteering opportunities are every Tuesday. There are also seasonal voluntary activities that you can support such as decorating the space for Christmas or helping with community events and exhibitions. To enquire about volunteering please contact us- we'd love to hear from you. Drake's Place is a community space, what else shall we do with it? The Drake's Place activity programme already offers lots of opportunities to be involved in a wide range of exciting projects and initiatives. We're always keen to hear from anyone interested in helping us bring the space to life and making sure it's open, accessible and, most importantly, welcoming. If you would like to join us, or simply contribute your feedback and ideas, we'd love from hear from you. Here you can find a whole host of activities, events and more for everyone and anyone. Play table tennis for free in Drake's Place. Ping! is a national table tennis initiative and everyone is invited to have a go - bats and balls are supplied. What's on in Drake's Place? Come on in and enjoy award-winning food and drink overlooking a calm and relaxing oasis amidst the whirl of urban living. Perched on the edge of campus overlooking the beautifully restored Drake's Reservoir and Gardens, Our Reservoir Cafe offer a haven of tranquillity, in an often sun-drenched position. The café opening hours are Monday to Thursday 8.30am to 4.00pm, Friday 8.30am to 3.30pm and Saturday 10.00am to 3.00pm.